Made you click didn't I? We weight loss/fitness peeps LOVE us some before/after pics. It was (and is!) a huge source of motivation for me. And so I took a before pic IN my bikini the other night. And to make it all the more "special," Ed took it for me. In good lighting. And without photoshop. Unfortunately I'm NOT going to post it until I have a good leg on some after-ness to throw next to it. That and Ed is like: "You're not putting this on your blog are you? Cause people are weird." And I'm like: "Uh, no. It's, um, for me. To look at. Because I.....like seeing myself in a bikini?" I gotta convince him you guys aren't weird. So, don't do anything weird, mkay? I plan to document my training progress (MUSCLES!). So I'll be taking pics every month. And I promise I will post them. Full frontal. Wait- no, not full frontal. Fully UNtouched. But I may need to wax first. And maybe tan a bit. And maybe get some lipo on the love handles and saddle bags. No, I'm kidding. Just the love handles. I only have 1 of those carbs a day and it's at breakfast. I do this so that I know it will be burned off throughout the day and not stick to me if I eat it at night. Remember- I'm trying to lean out for this competition- I will not eat this way forever, nor do I think it's sustainable for that long. I prefer to go to bed on a mostly empty stomach so that I burn good fat the next morning at my workout. And I hear it's all the rage. I limit fruit to only 2 servings per day- but give it a free for all on any non starchy veggies- which give me plenty of carbs and fiber. I do try *gasp* to limit my mochas to 3-4 days a week as opposed to 7. My calorie intake on average is about 1300 per day. I plan my meals the day before. Down to the snacks. That way I can relax and just grab my food during the day. It's actually much, MUCH easier than I thought. Planning makes everything easier. But I'm only on week 1. LOL Look at me talking like I'm a pro after having just done this for a week. And since I can't provide shocking before/after pics for you- I'll leave you with an after, AFTER pic. 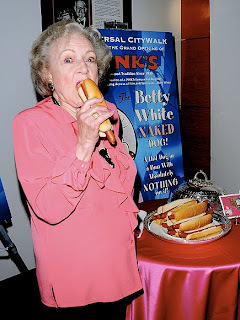 I want to be Betty White when I'm old and fabulous. I totally clicked b/c just like the rest of America I LOVE before and after pictures. My hubby doesn't care at all that I post before and after pictures. He says they aren't all all risque. It's just a human body. (Not very romantic or sacred I know). It inspires people. (So I've been told) I really don't like having my before ones up b/c it's sort of embarrassing but if it helps someone feel like they can do it too then it's worth it to me. I know before and after pictures of others were a huge inspiration for me. I'm rambling. Can't wait to see your after pictures. I know. I thrive on before/after pics with others. Keeps me motivated. And I really stay focused when I can compare and see progress with my pics. Ed just doesn't get how addicted us fitness/weightloss ladies are to "proof" pics. He's thinking of the theoretical nasty guy that's seeing pics of his wife. Which I get too. But... There will be pics soon!